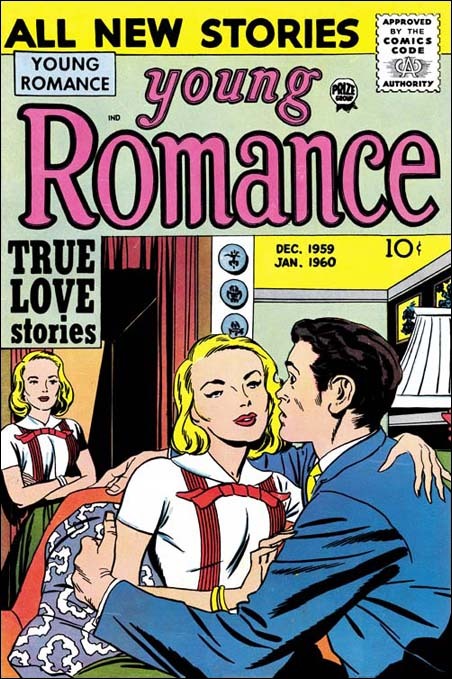 In recent entries of the serial post of The Art of Romance (Chapter 34 and Chapter 35) I discussed the cover art by an artist who used the initials JO. 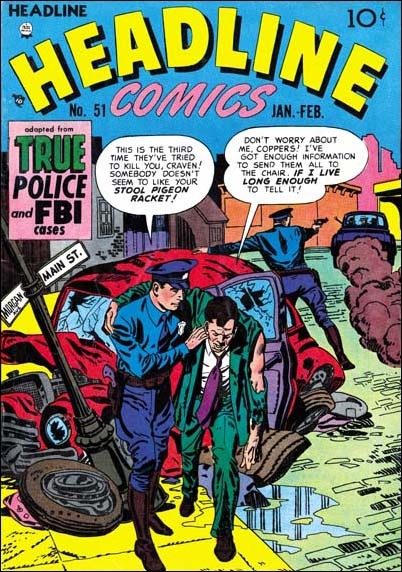 Although I have not yet written about him in my other serial post, Criminal Artists, the same artist also did covers for Justice Traps the Guilty. I had tentatively credited Joe Orlando as the artist in question. The main reason for uncertainty of this conclusion was that I had not had a chance to do a comparison of work from this period that can be confidently attributed to Orlando. One great thing about databases is that the remember details that the human mind sometimes forgets. 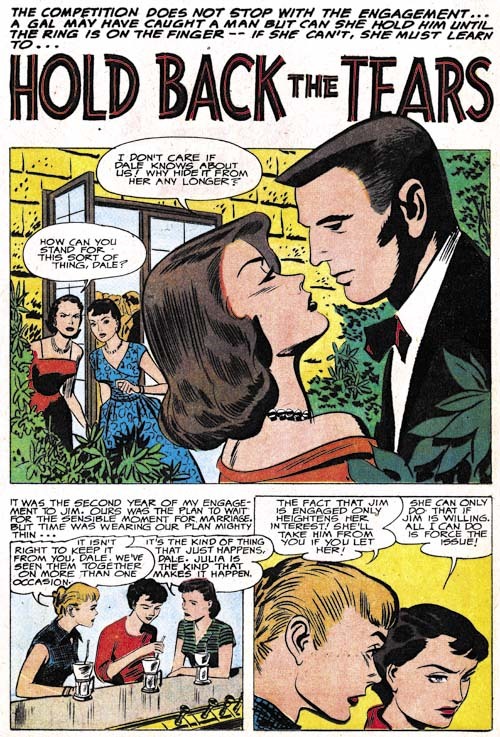 I was pleased to find that my database indicated that I did in fact have something with a full signature by Joe Orlando, “The Hidden Doors” from Black Magic #34 (September 1957). 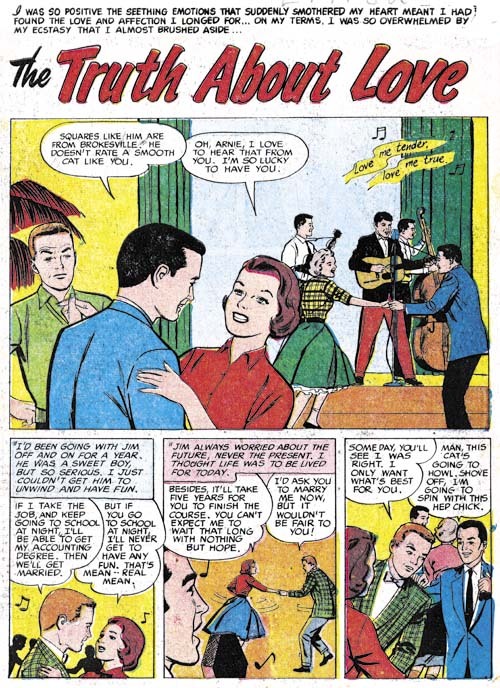 This was the first issue of the re-launched Black Magic (the final issue of the earlier run was cover dated November 1954) . 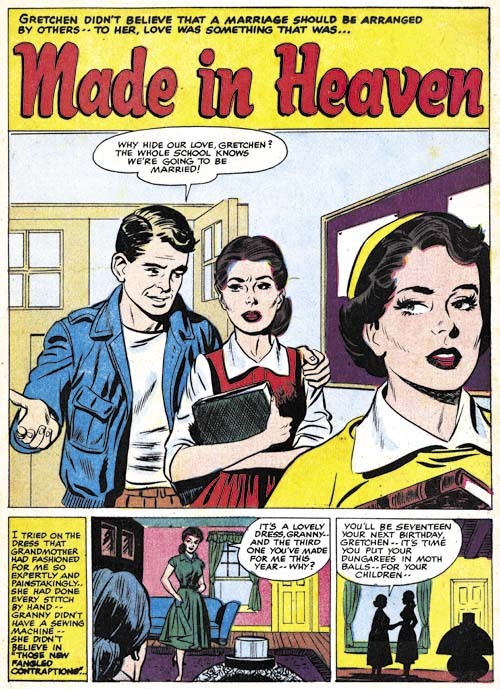 The new series was a very different comic from the earlier, Simon and Kirby, produced one. I am sure I will someday do a serial post on the second Black Magic run. But let me get back to the actual subject of this post. 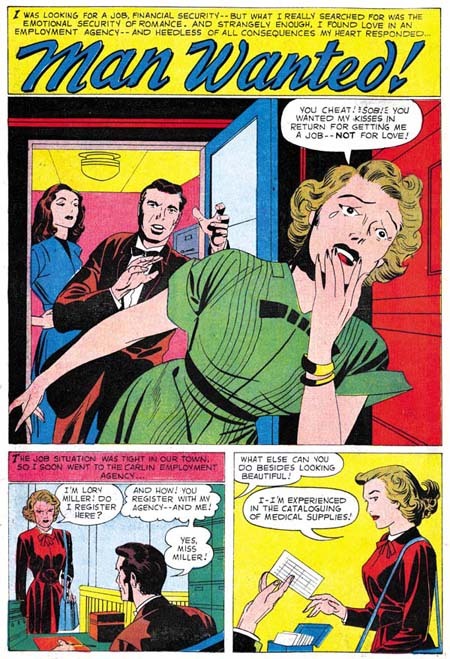 While “The Hidden Doors” was a different genre, there are enough similarities to the romance and crime covers that I believe all were done by the same artist. Further the date for the Black Magic piece is perfectly aligned with the cover art. Therefore I am going to dispense with the question mark and just go with the Joe Orlando attribution. 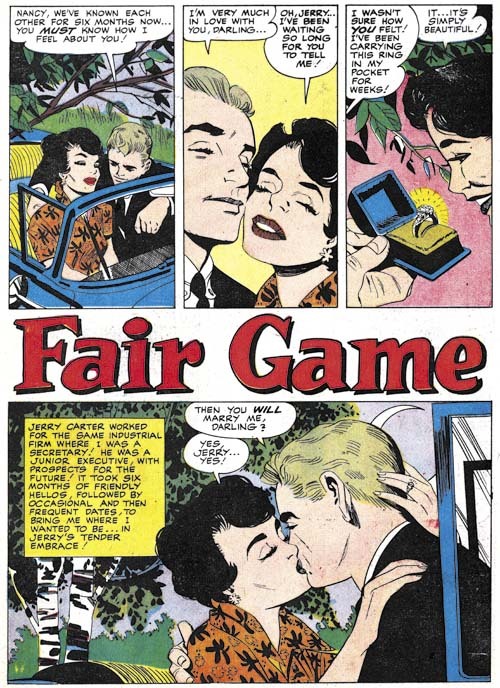 Posted June 30, 2007 in 2007/06, 5 Studio, 7 Freelance, Artists, DC Kirby, Kirby Inkers, Periods, Prize, Serial Posts, Stein, Marvin, z Archive. 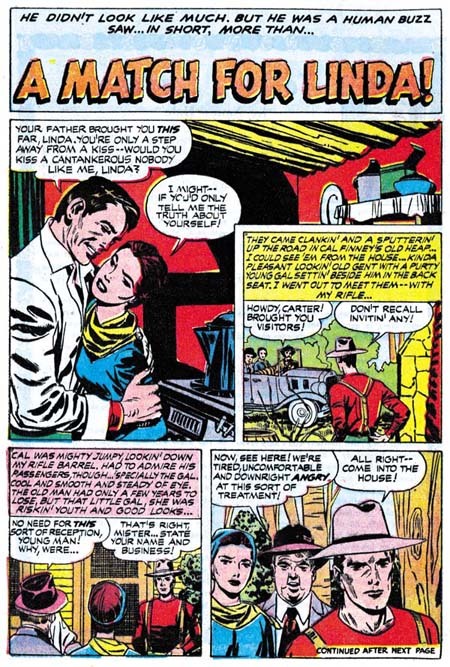 I have written about Kirby inking Kirby, but what about Jack’s other inkers? 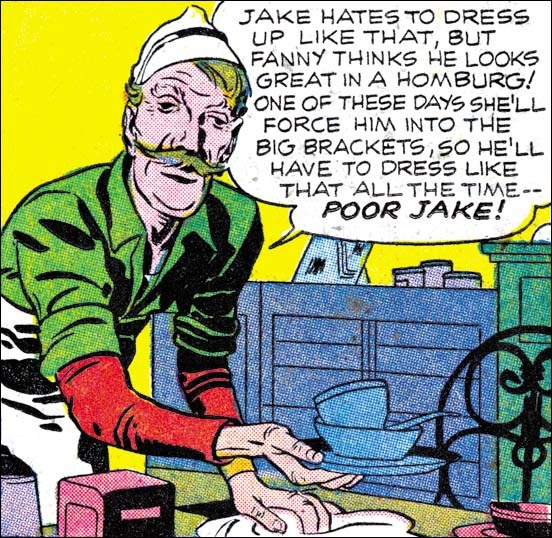 Scholars of the Silver Age have it comparatively easy, many of Jack’s inkers are actually given credit. This provides a head start even in those cases where no inking credits are given. 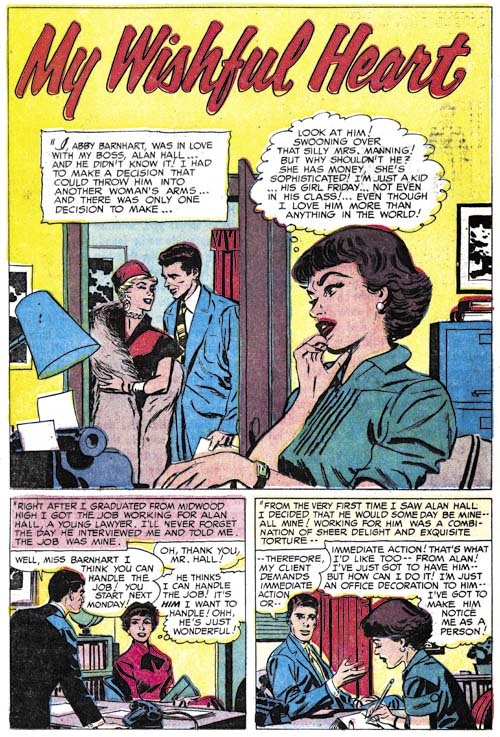 But in the Simon and Kirby years no inking credits were ever provided. Fortunately most S&K studio artists inked their own work. 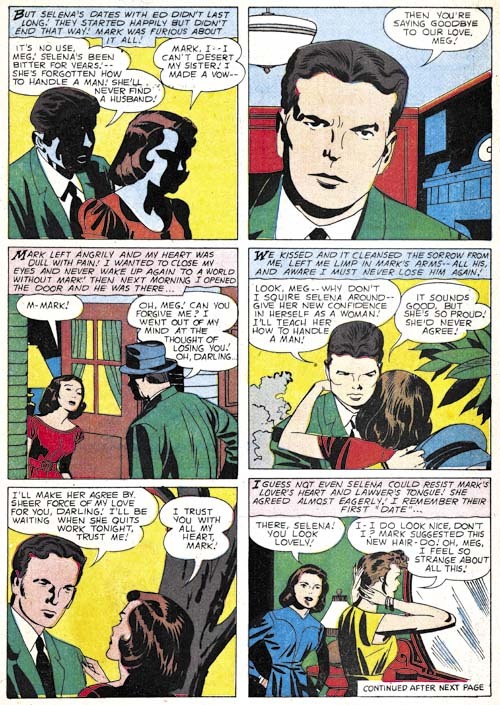 Therefore examining the work by the studio artists can give insight into what to look for in order to determine if they also were Kirby’s inkers. I am going to start with Marvin Stein. What I am going to say about Marvin is pretty preliminary. 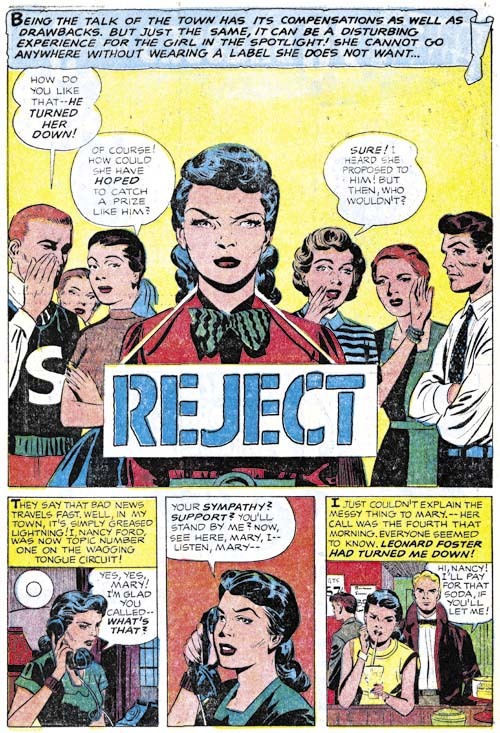 I really have not studied Stein as an artist as much as I have other who had worked for Simon and Kirby. This is probably because I have mixed feelings about Marvin’s art. On the positive side Stein was often good at depicting action. However some of his drawing seems a bit crude. 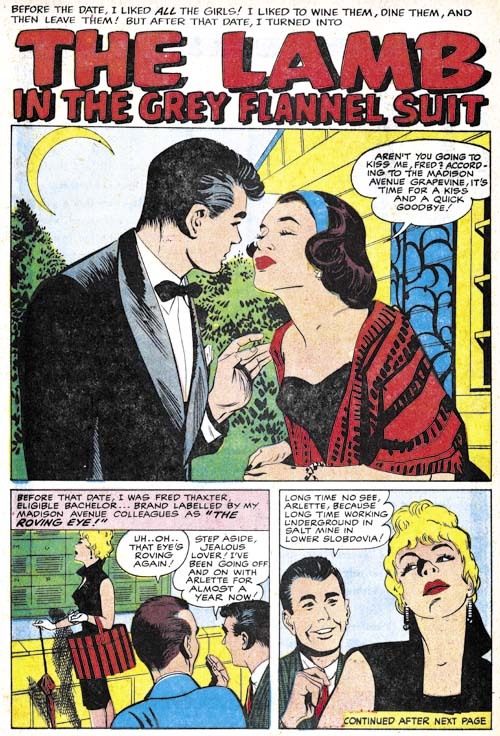 Marvin Stein starts showing up in Simon and Kirby productions in 1951. 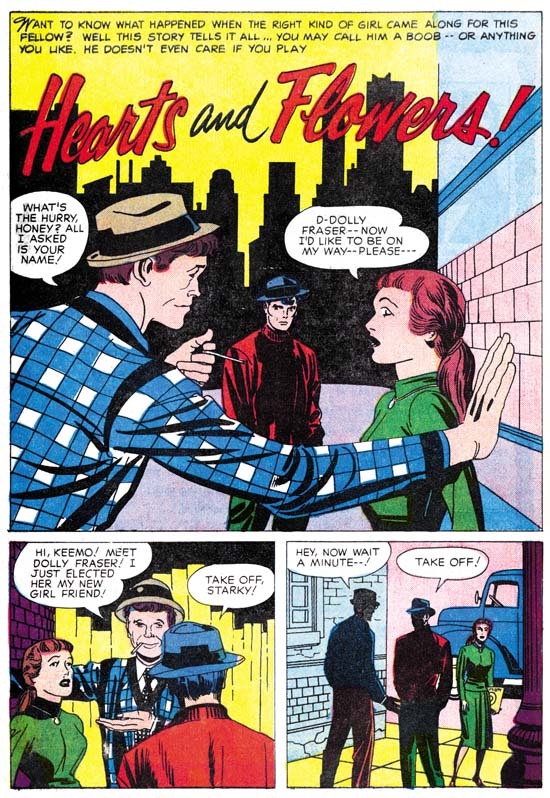 Not long after his appearance there seems to have been a change in the production of Headline and Justice Traps the Guilty, two crime titles that S&K had created. Well actually Headline had existed before S&K but was not a more general anthology, it was S&K who converted the title to crime. The postal statement for Headline #46 (March 1951) lists Nevin Fiddler as the editor. 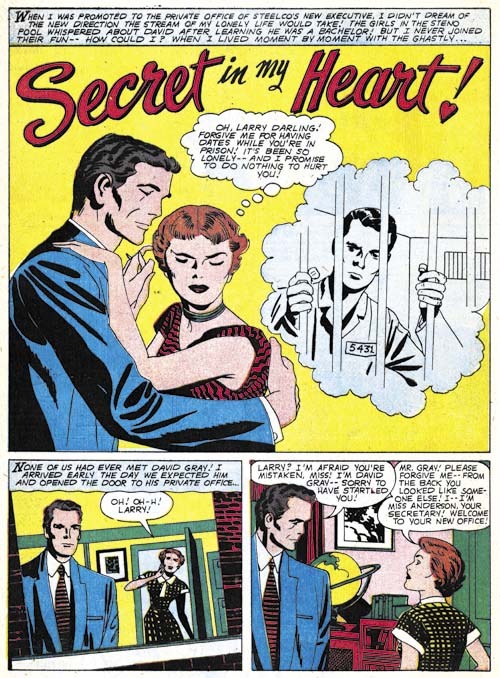 About that time the artists for both crime titles changed and Jack Kirby work would no longer appear. Marvin Stein would become a prominent part in the new Prize crime issues. 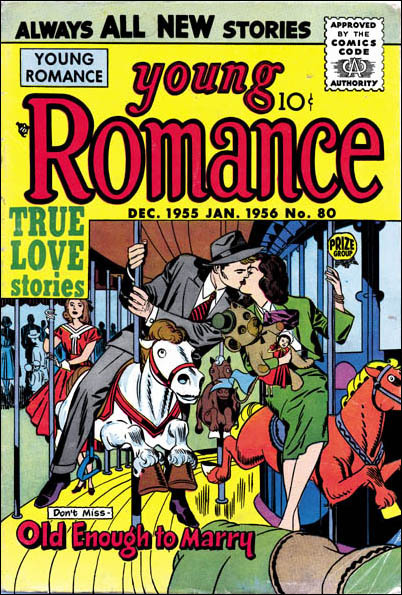 Stein did almost all the covers and usually the first story. 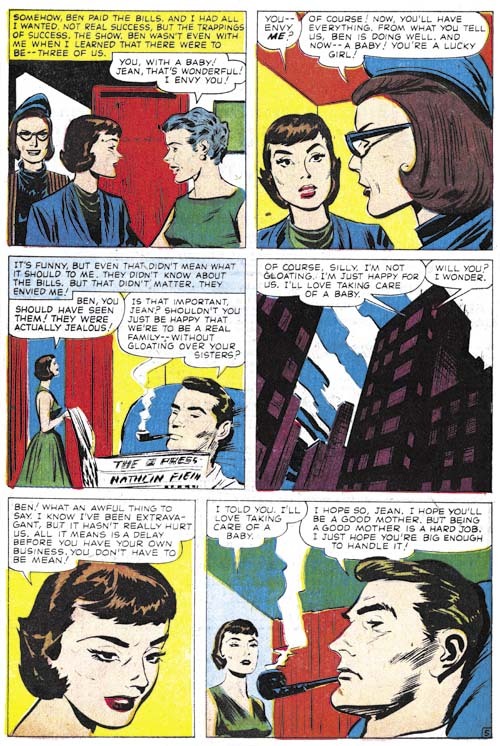 It was not that unusual for Stein to provide a second story as well. There is a photograph that indicates that Marvin worked at the Simon and Kirby studio at one time. 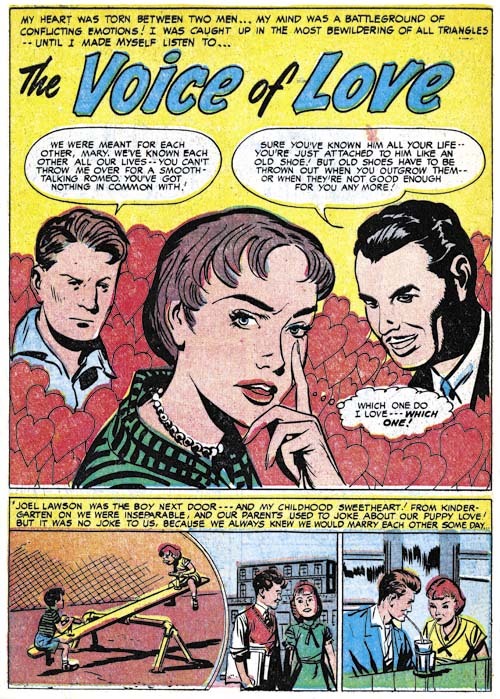 Certainly he was greatly influenced by Jack Kirby, particularly in the portrayal of action. But Stein did not pick up any of the typical S&K studio inking. 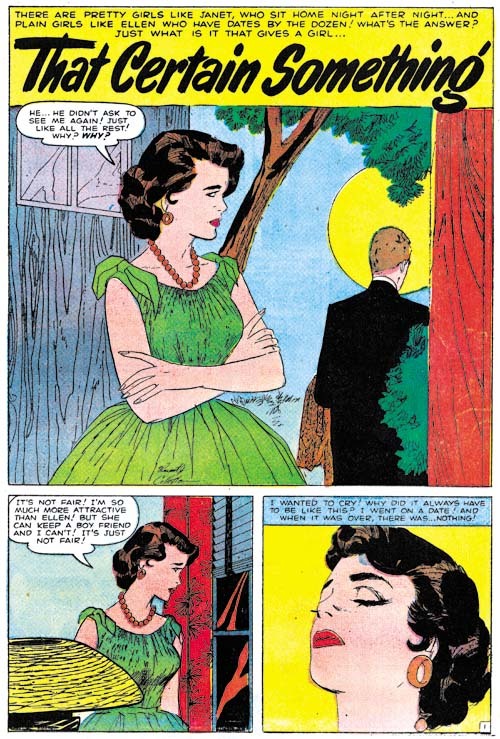 Missing from Marvin’s own work are things like picket fence brush work, abstract arch shadows or shoulder blots (see the inking glossary). Stein did occasionally use something like drop strings. 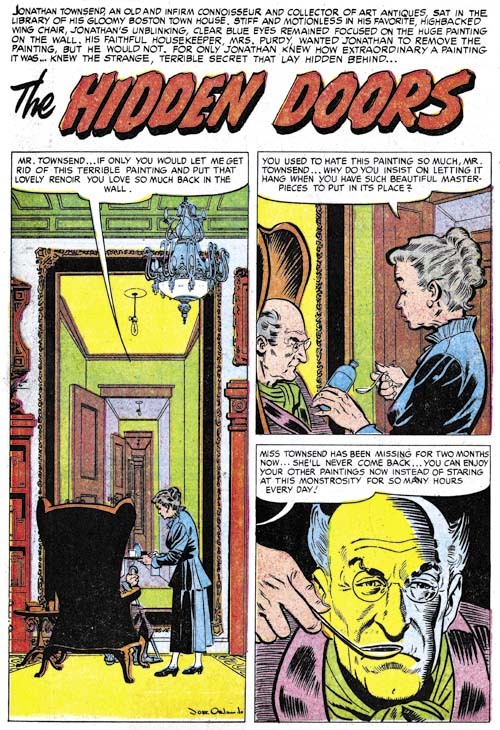 The above image is a typical page of Stein pencils and inking. Marvin’s brushwork tended to be rather blunt. 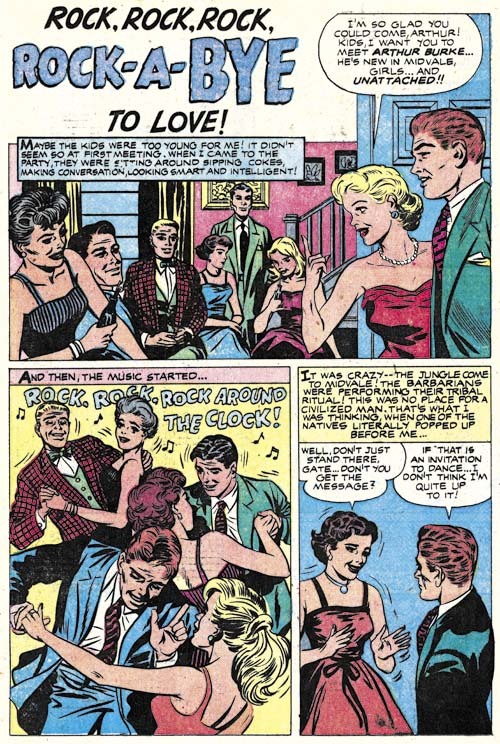 This can be very apparent when the faces are of a smaller size, as for instance in panels 1, 2 and 4. 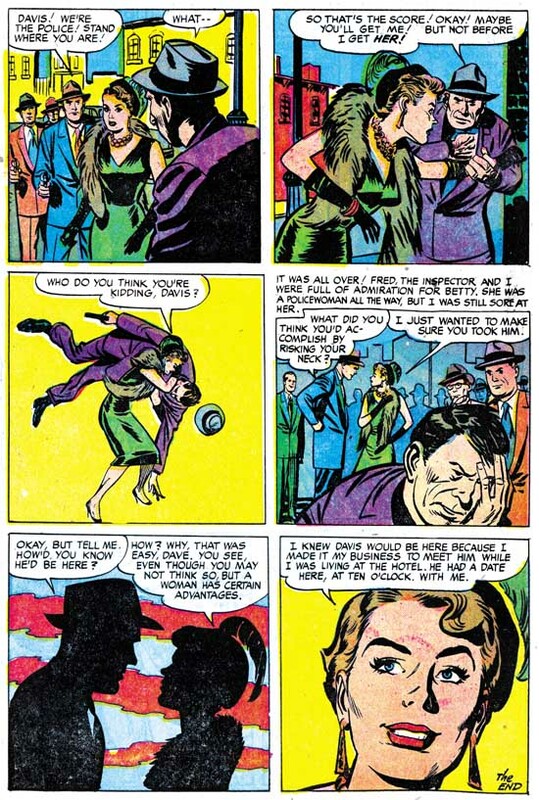 A blunt brush work can even be seen in closer faces as in the criminal in panel 4. 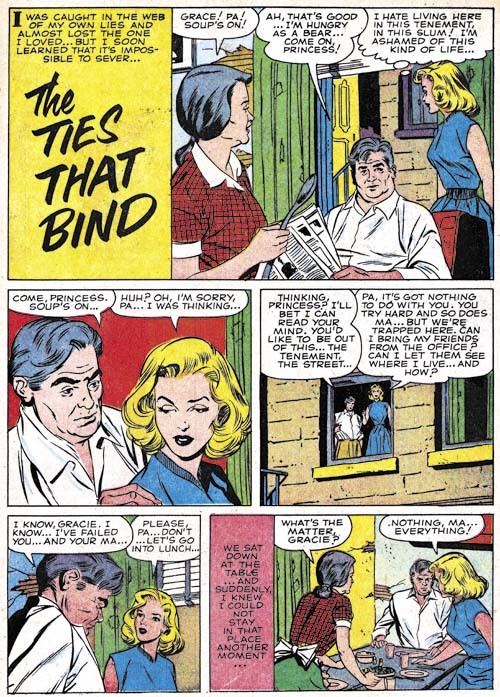 Stein often would use very broad cloth folds that seem slightly bent at about the middle of their length as seen on the man in the foreground in the first panel. 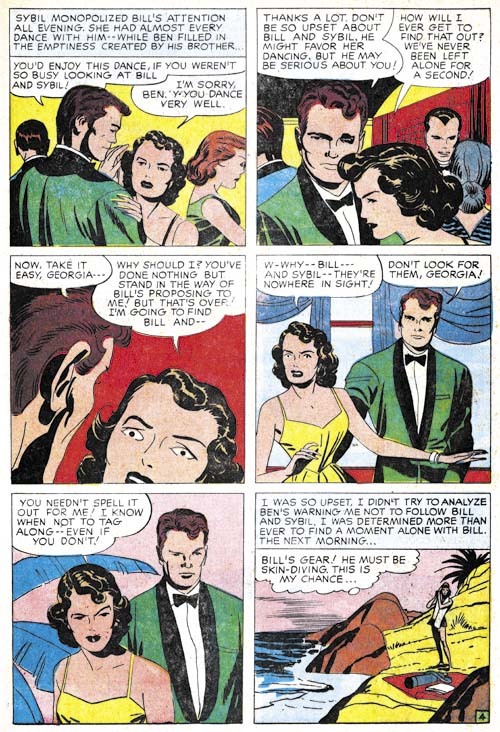 Cloth folds often have ends that stop abruptly at a right angle (as in the first panel) or a slight angle (there are a couple examples on the man in the second panel). Form and shingle lines are often quite robust. Although not apparent in the image above, Marvin would sometimes make long and simple eyebrows. 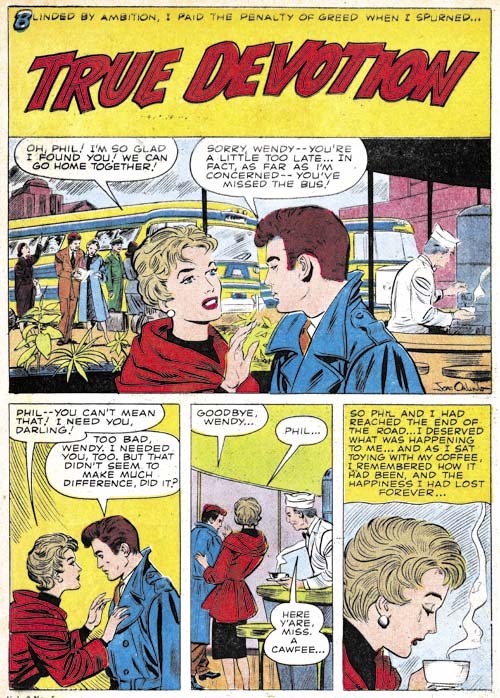 These eyebrows can resemble those by Bill Draut. Occasionally Marvin would like to depict faces with a sort of negative highlight, as in the image above. This is done with diagonal brush work and like so much of Stein’s inking in a rather crude manner. 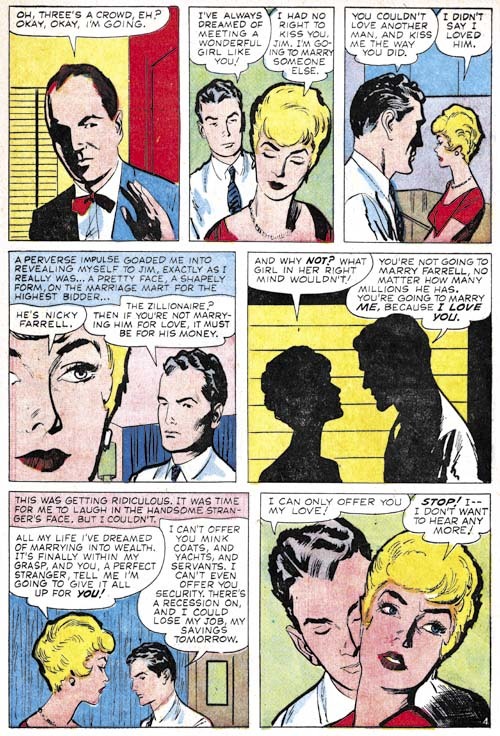 Among Jack Kirby’s late Prize romance art is one story, “Jealousy”, where the spotting for the facial features is rather blunt. 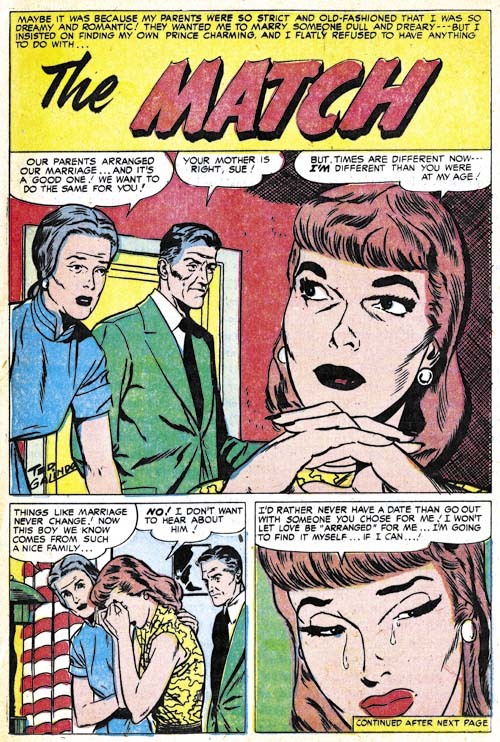 The facial inking looks so much like Marvin Stein’s that I am certain he was Jack’s inker. 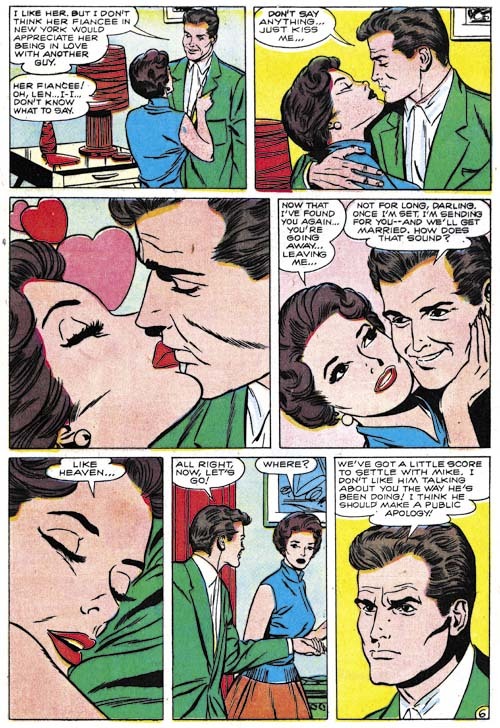 Note the final panel where the man’s right eyebrow is extended into a crease above the nose. This is a characteristic often seen in Stein’s own art, for instance panel 3 from the Justice Traps the Guilty #88 page I showed earlier. Surprisingly the spotting other then for the faces in this story seems more carefully done then is typical for Stein. 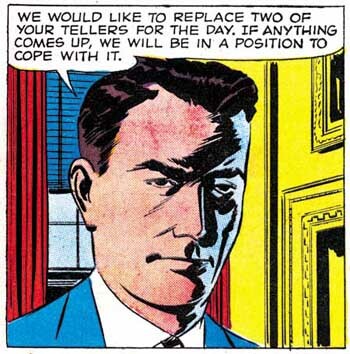 This blunt treatment of facial features does not seem to occur in inking for any other of Kirby’s work for Prize. 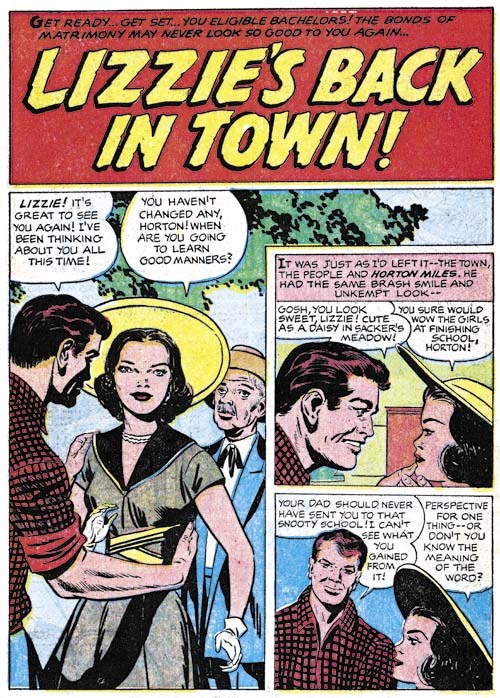 But otherwise similar spotting can be found in the inking of a number of Kirby stories. 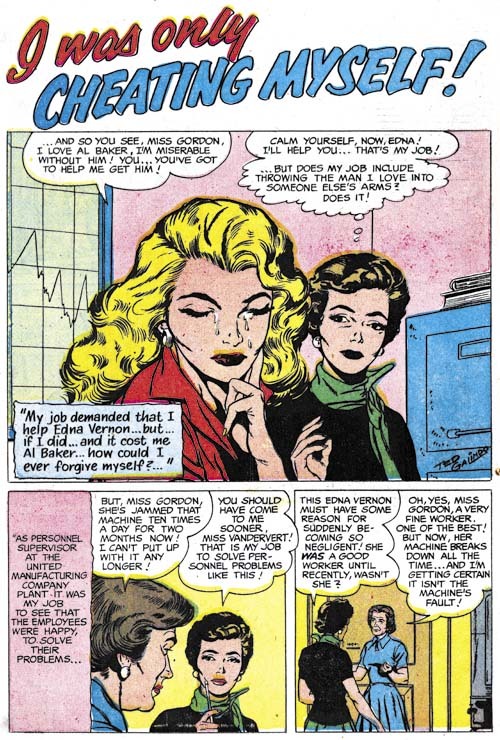 Could it be that Marvin Stein used greater care when inking for Kirby then he did on his own work? 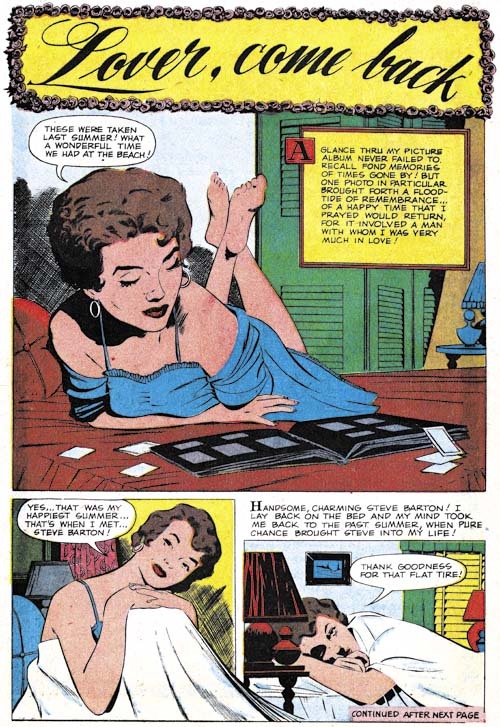 Depending on the answer to that question, Stein could have been a frequent inker of Kirby or a rare one. 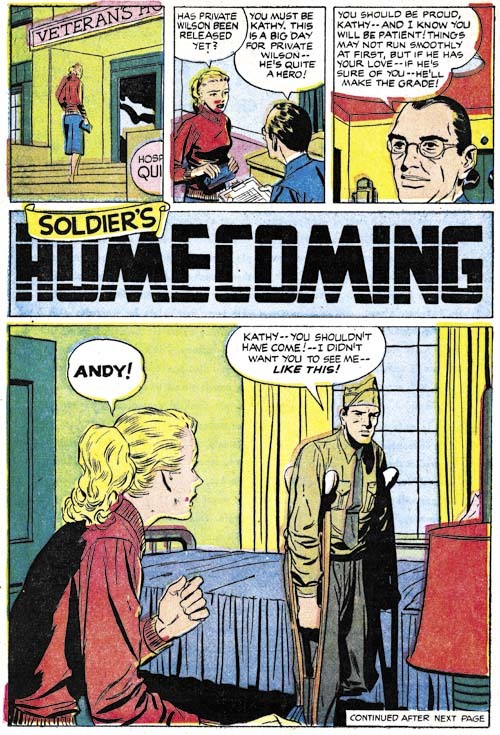 When I wrote the DC chapter to “Jack Kirby Austere Inking” I was hampered by my limited access to the work. 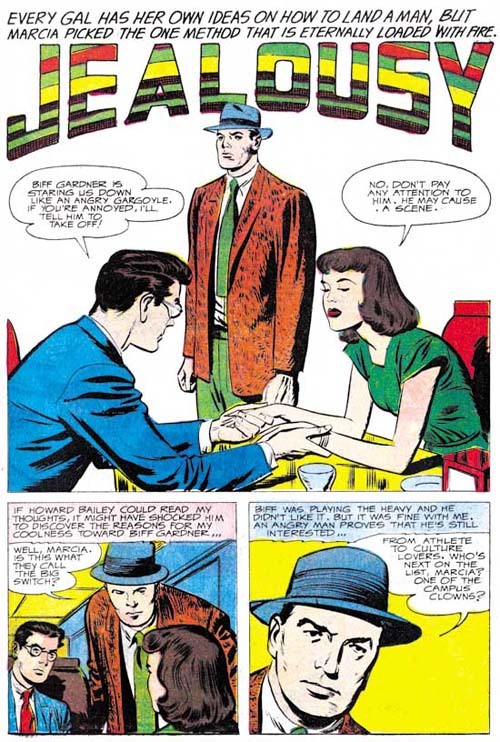 I am still not ready for a more thorough evaluation of Jack’s DC period but I have gone back over it with Marvin Stein fresh in my mind. Previous I attributed the inking to the initial Challengers of the Unknown stories to Jack. With my latest review I find a number of examples of inking that look like Stein’s work. 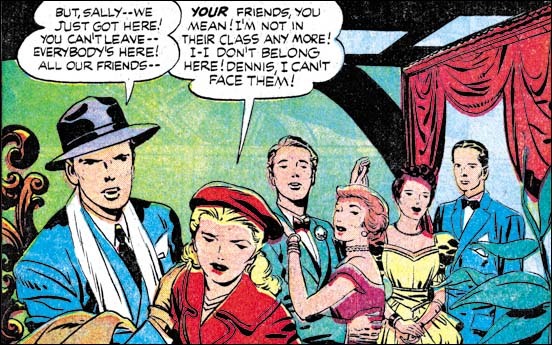 Take a look at the face in the panel image I provide above, it has Stein’s blunt brushwork style. Also note that a couple of the cloth folds have the slightly off right angle ends that Stein prefers. There is still inking in the first two Showcase issues that look like Kirby’s brush. The red giant in “Dragon Seed” from Showcase #6 seem much better done then I have every seen Stein do. Also the second page from Showcase #7 with its scenes of the Challenger members doing various daring deeds. The problem is that Stein’s blunt brushwork is rather similar to Jack’s Austere style. I now suspect that most of the inking for Showcase #6 and 7 was actually done by Stein with Kirby doing the more difficult parts and perhaps touching up Marvin’s work as well. 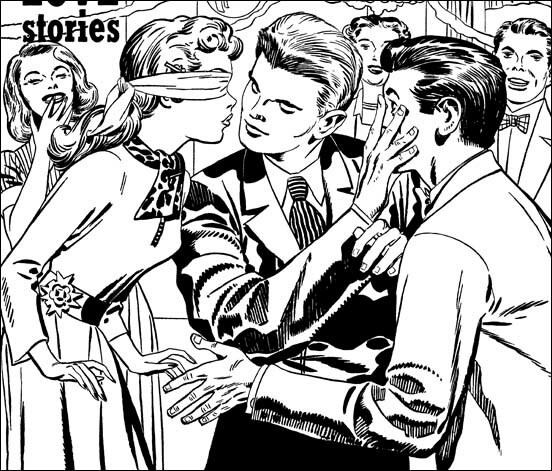 Marvin Stein did some of the inking for later Challenger stories also. 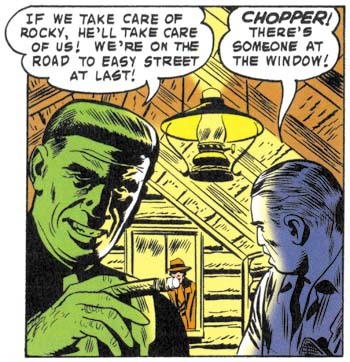 The image above from COTU #3 has the same shadow highlights we saw before from Stein’s crime work. 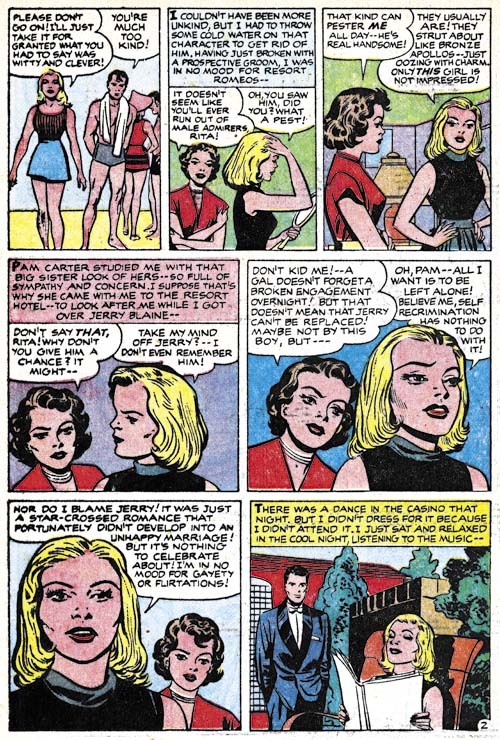 But these later inking differ from Showcase #6 and #7 in that Jack Kirby does not seem to have taken a hand in any of the spotting. I have added a checklist for Marvin Stein, which like all my checklists are works in progress. However a checklist of Stein’s inking Kirby will have to wait, at least until I have reviewed some of the other Kirby inkers. Posted June 2, 2007 in 2007/06, 7 Freelance, Periods, Prize, z Archive. I last discussed Kirby inking for Prize in Chapter 3 (stories) and Chapter 4 (covers). 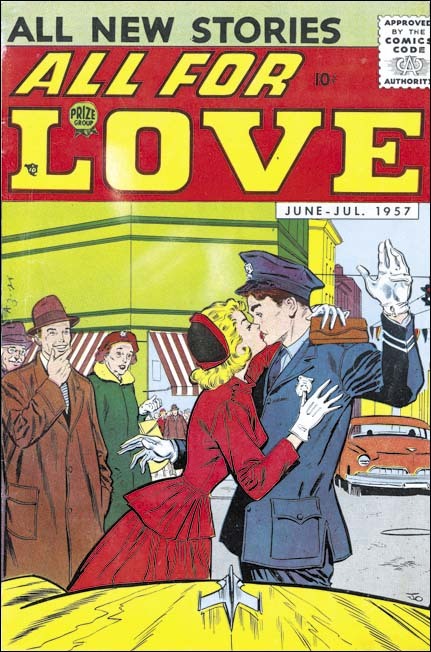 Both chapters only covered 1956 with the first appearance of the Austere inking style. 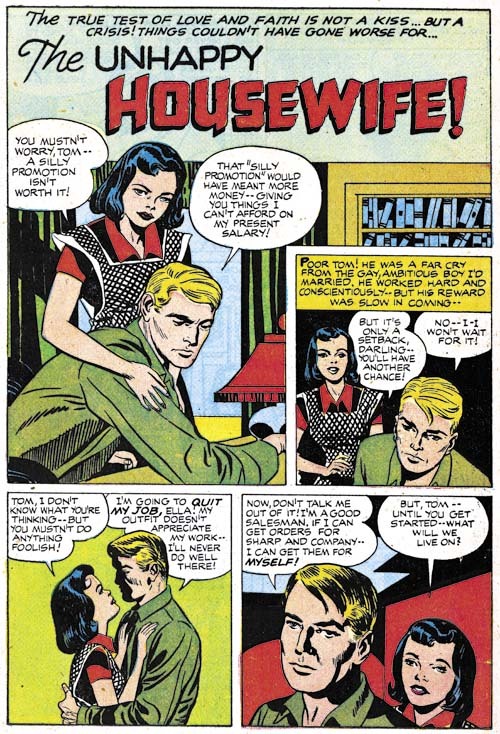 During that year Kirby was doing almost all the penciling for all three Prize romance titles (Young Romance, Young Love and Young Brides). 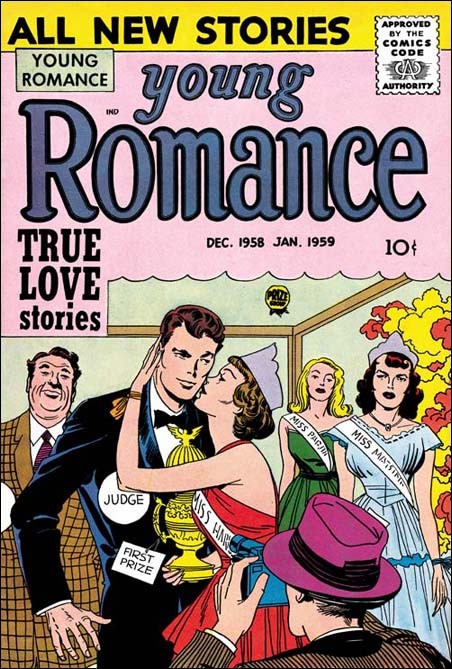 At the end of 1956 Prize comics had a shake up; Young Love and Young Brides were cancelled. 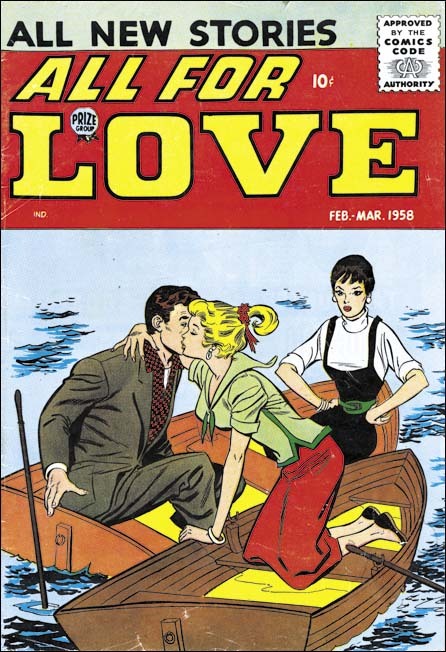 Young Romance remained and a new title, All For Love appeared. 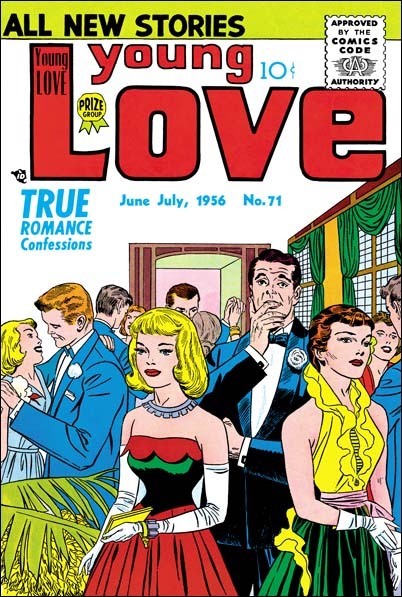 Simon and Kirby continued to be listed as the editors for Young Romance but All For Love was edited by Joe Genalo. 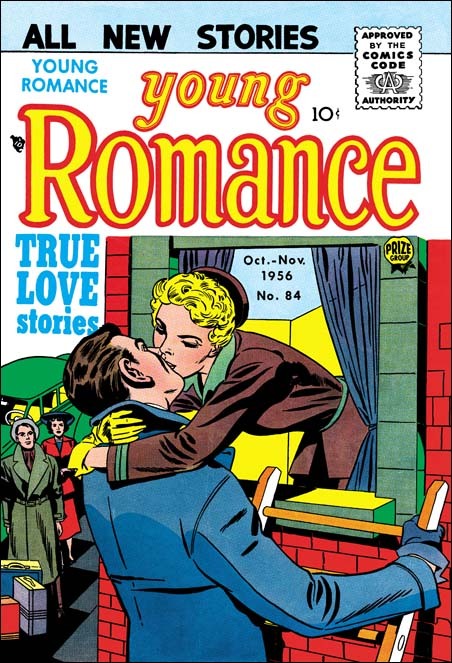 Young Romance was just not the same comic. Gone were such stalwarts of the S&K studio such as Bill Draut, Mort Meskin or John Prentice. Most of the artists that did appear in YR were simply not as talented. This leads me to the conclusion that the pay scale for art had dropped and YR could not attract the same skill level. Normally I would be picking up with Prize where I left off, that is with 1957. 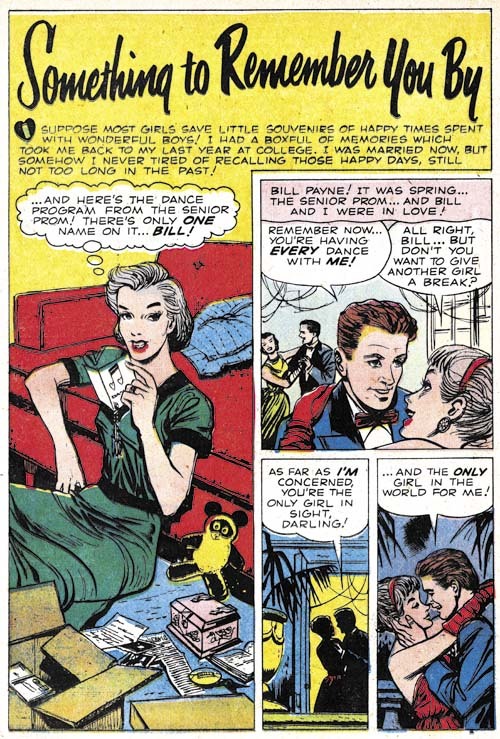 Although Jack provided art for Young Romance during 1957 he did not ink his own work that year. 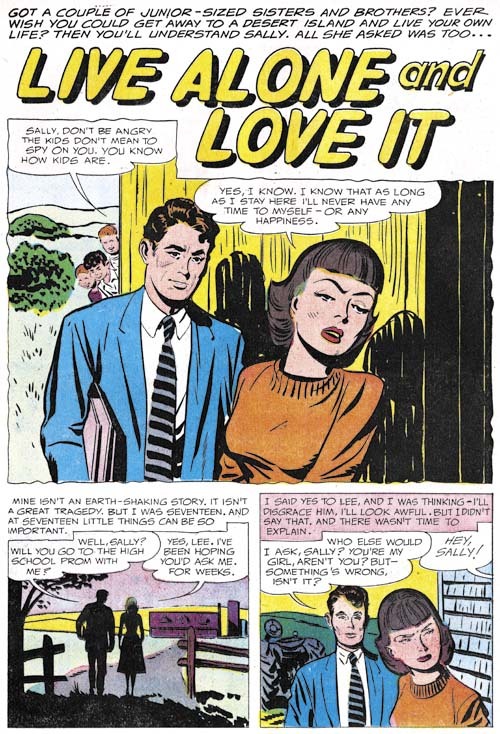 Kirby resumed inking some of his work for YR early in 1958. At this point in time Jack was no longer inking what he did for Atlas, at least as far as the work I have looked at. What inking by Jack for DC that we have examined (unfortunately an inadequate number) was done in the Austere manner, with or without pen spotting. 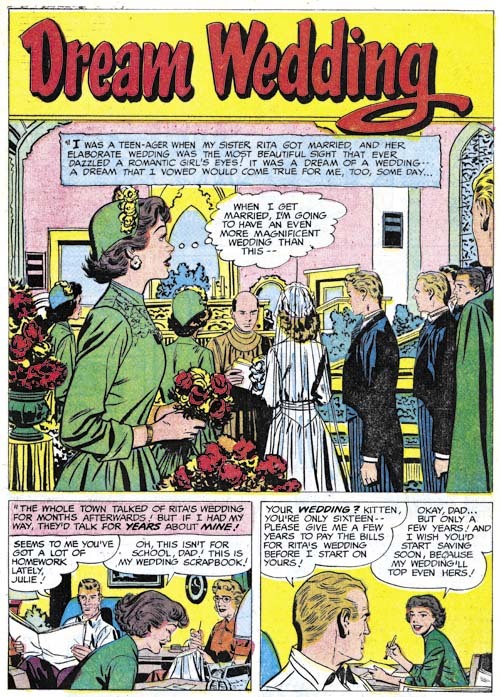 Jack’s last job for Harvey with his own inks (Alarming Tales #3) was done just before he had resumed inking some of his Prize art. That particular piece was done in typical Austere style with some pen spotting. Considering the date it not surprising to find this cover as inked in the Austere manner. An overall lightness and simple cloth folds that cluster at the shoulder and the elbow. There is one hold over from the older Studio style, the drop sting near the man’s elbow. That drop string is however made from individual drops overlapping one another to produce a sort of toothed line. This sort of brush work has been observed in other Austere inking as the preferred drop string rendition. There is one type of spotting that should be noted. It has a long history of use but I have not given note of it in my previous chapters. I think of it as shingle lines; the use of parallel lines where each is offset slightly from the others. Good examples can be found on the dress of the woman on our right. In this case I want to point out the two sets of shingle spotting just above her waste. What is special about them is that they were done using a pen. All other spotting on the page was done using a brush although some of the simple folds are done with a pen as well. 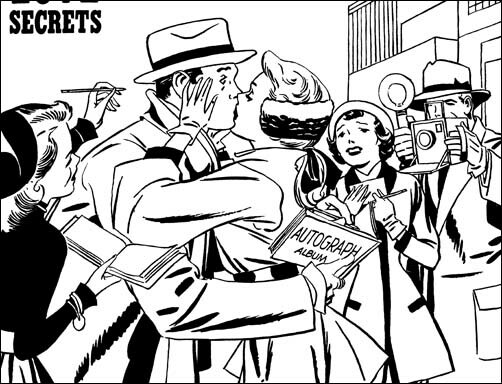 Still there is nothing like the pen work we have seen on some of Jack’s inking for DC or Atlas. 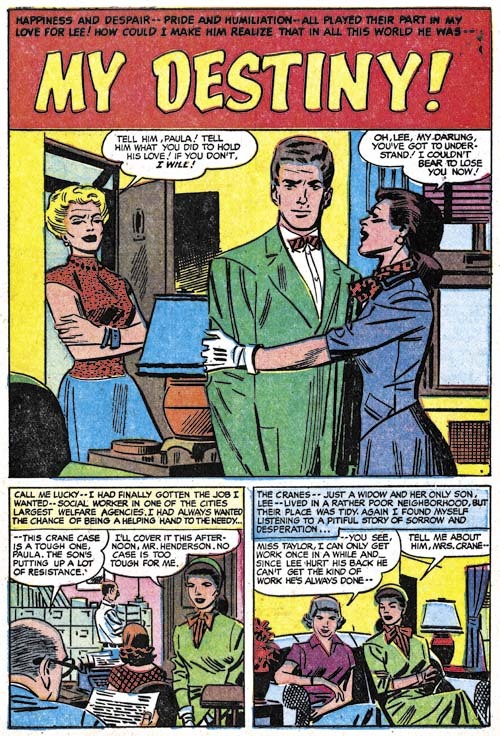 This story from the same issue is also done in the Austere manner. Is that a shoulder blot on the young man or a special feature to his shirt? I am not sure but it is certainly unusual. The man in the splash provides a better example then the cover of simple folds inked with a pen. It would appear that Kirby (or assistant) inked the outlines and folds with a pen. Those that Jack wanted to augment would be gone over with a brush. Kirby would sometimes skip brushing over some lines and so leave the penned lined unchanged. Generally Jack would use simple spatulate shapes for some of the cloth folds. But not always as sometimes longer and narrower folds are called for as in this splash. However other pages from this story provide examples of simple spatulate folds. 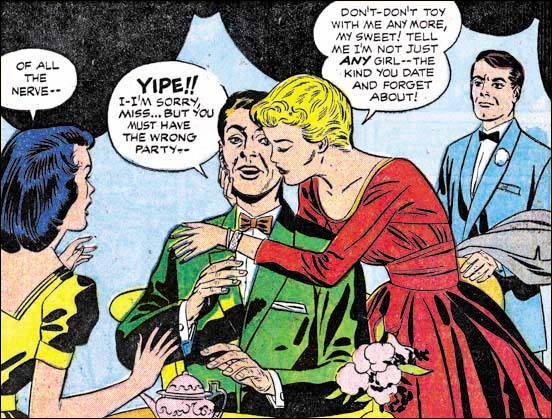 I can understand some mistaking the inker for this story to be Jack himself. There are things that resemble shoulder blots. Here however they seem restricted to one side and denote a shadow. There are also some brush work that look like picket fences. I am less bothered about that lower rails are not provided then by the form of the pickets in the second panel. These pickets are bowed as well as having ends that are narrower then the middle parts. These are traits I have not found in Kirby. Of course picket fences were abandoned when the full Austere style was adopted. 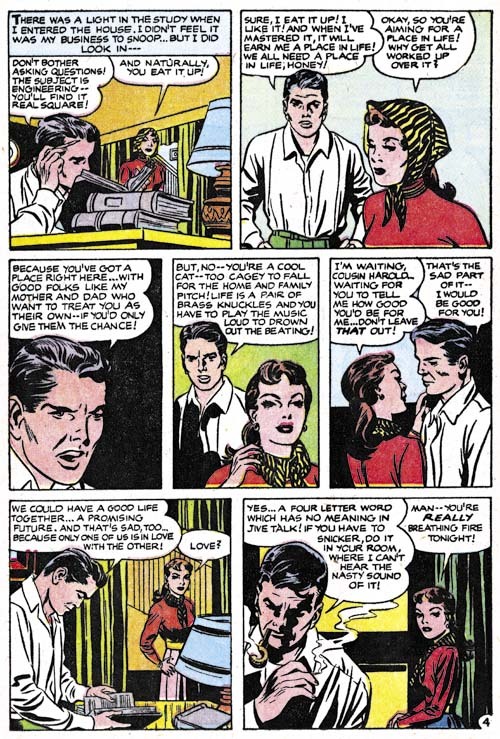 The thing that really bothers me about this inking are the very narrow and long folds such as found in the last panel. 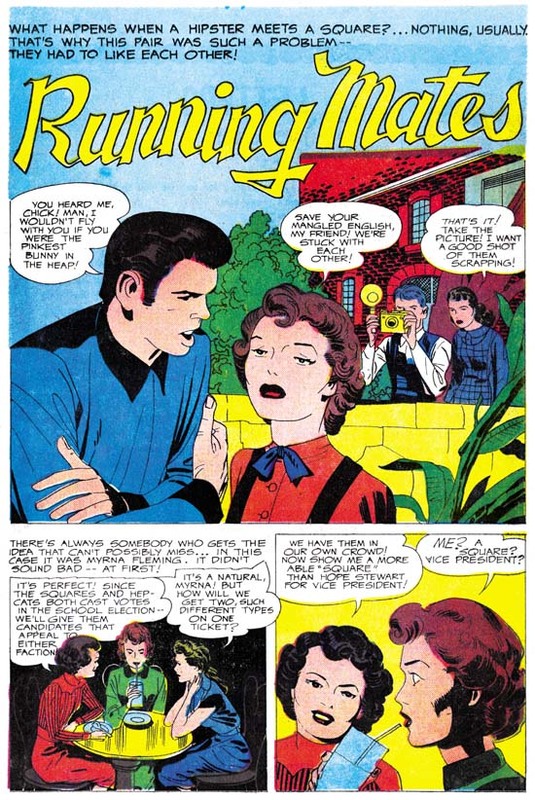 We saw examples of narrow folds in “Running Mates” but that story also included panels with typical spatulate shaped folds. 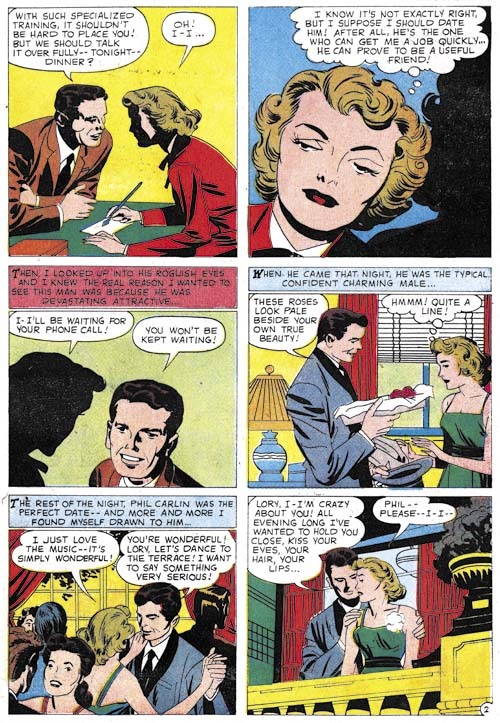 The rest of the pages in “The Happy Bachelor” continue with the same sharp folds. 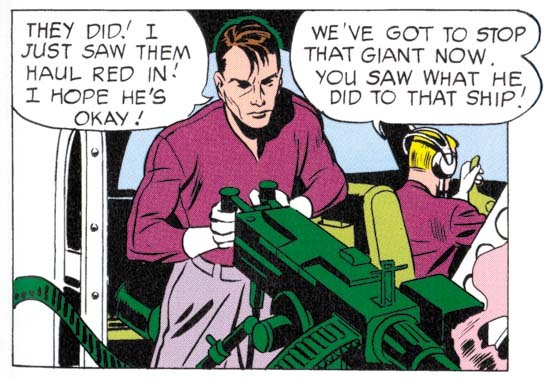 Another good example of Kirby’s Austere inking. Spatulate shapes for folds, some folds left as simple penned lines, some black areas flooded with ink, and negative folds on the lady’s arms. One unusual feature is the use of pen crosshatching to make a transition from the upper black area to the lower light zone. 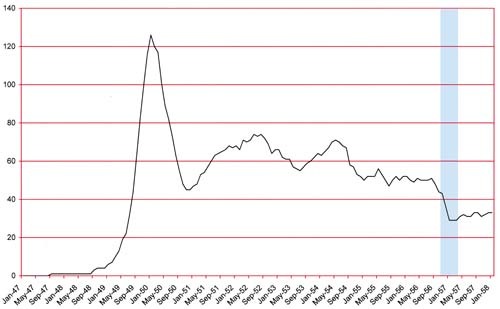 I have not commented about this before but one of the unique characteristics of these late Prize version of the Austere inking is how rarely a pen is used for any spotting. But we know Jack’s inking for DC at this time has examples similar examples of pen use so we should not be too surprise of the pen use here. Note how abstract Kirby has become in features such as the eyes. 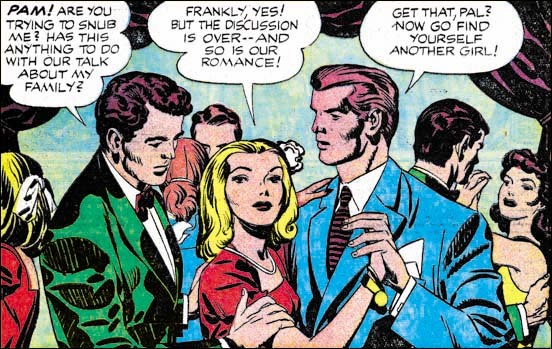 Jack has even done away with fingernails on the man in the splash panel. The way that Jack inks seems to have affected his drawing as well. At this point there is not a lot to add in terms of the Austere style. 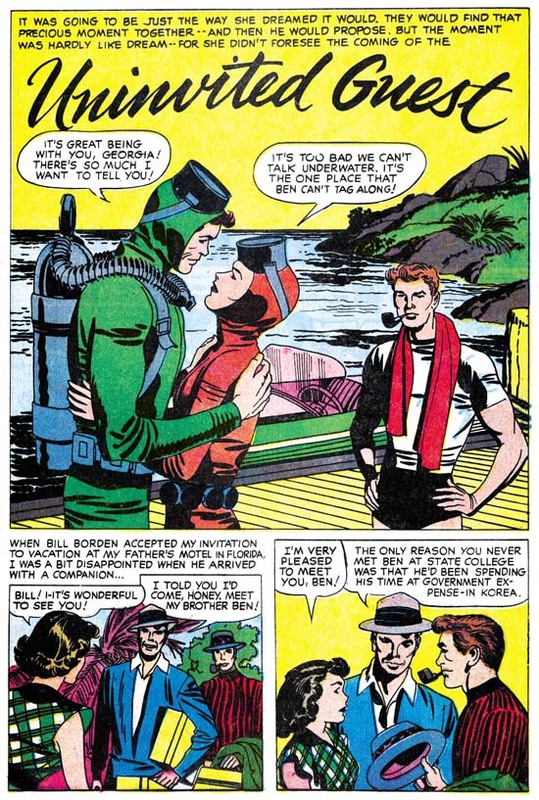 So I just want to provide some further examples from Young Romance. 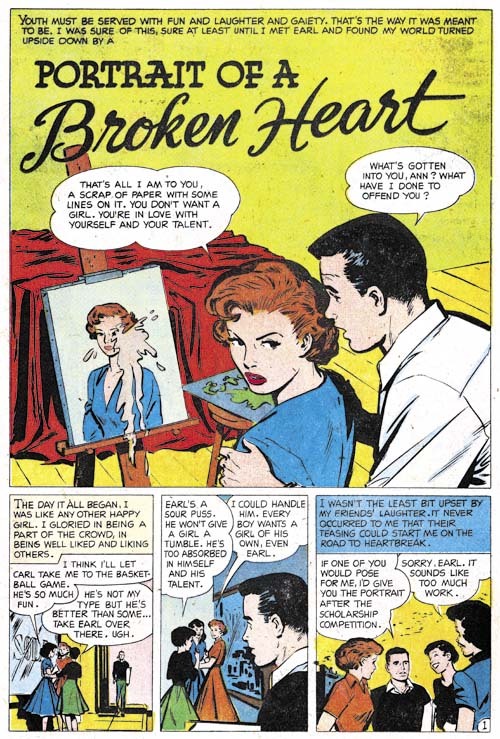 But do note in all these images how Jack’s Austere brushwork almost looks like it was done without a brush. This was not always true. 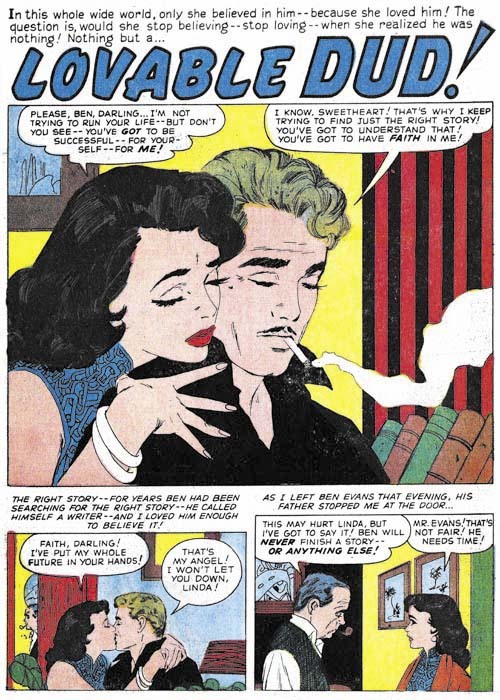 For example in the Studio style Kirby would often make use of dry brush, where the brush does not have much ink so that as it goes across the paper the ink is left in discontinuous streaks and spots. You pretty much never see dry brush in the Austere style. You also see a limited use of the brush tip in the Austere style. You will see it in some of the long and sharp cloth folds. But most other brushwork looks like the ink was poured on. I am not sure whether Jack was using a blunt brush for much of the work or using techniques like the Chinese painters used where they “hide” the tip by starting a stroke in one direction for a short distance before reversing back over itself. 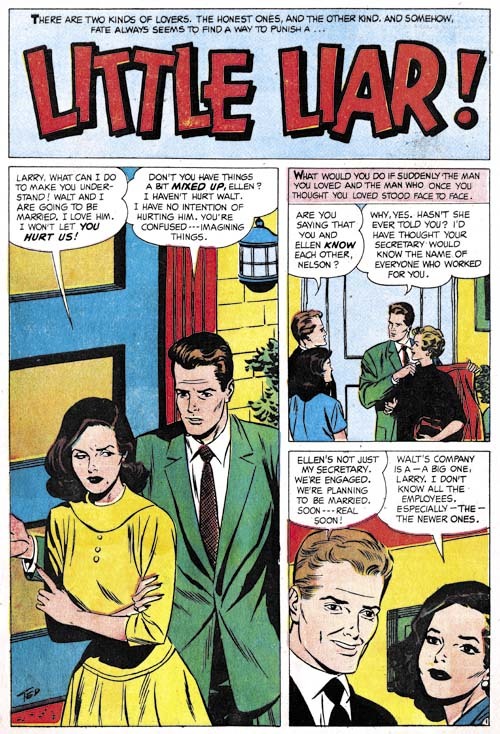 Another example of the stylized eyes and eyelids that Kirby was doing during his Austere period. 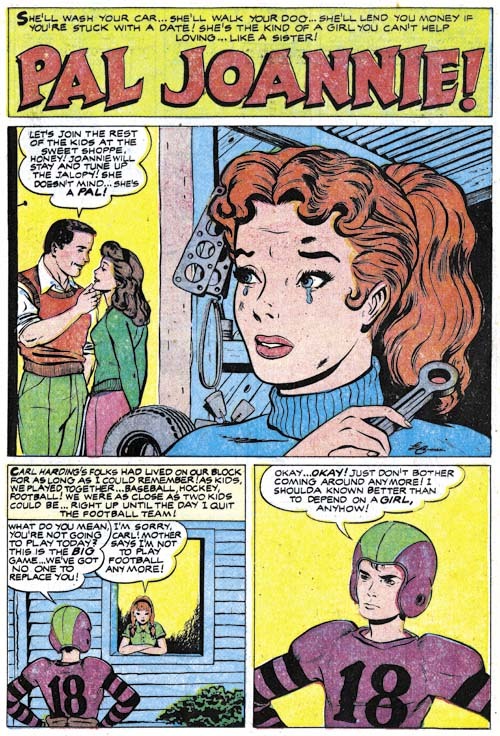 I realize Kirby was famous for all the action he used for his superhero genre work. But look what a dynamic splash this is! Neither punches nor incredible superpowers but still an exciting page. 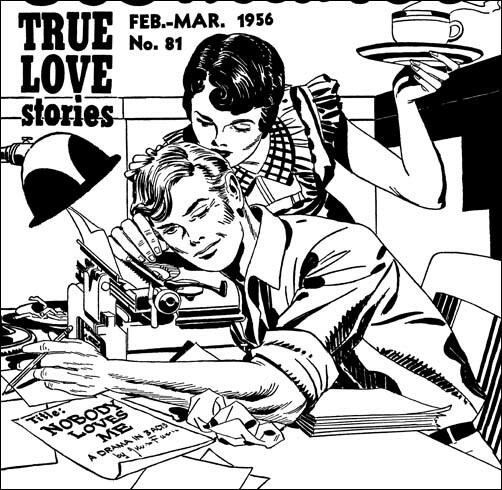 Jack was no longer inking his own Atlas work since early 1957. 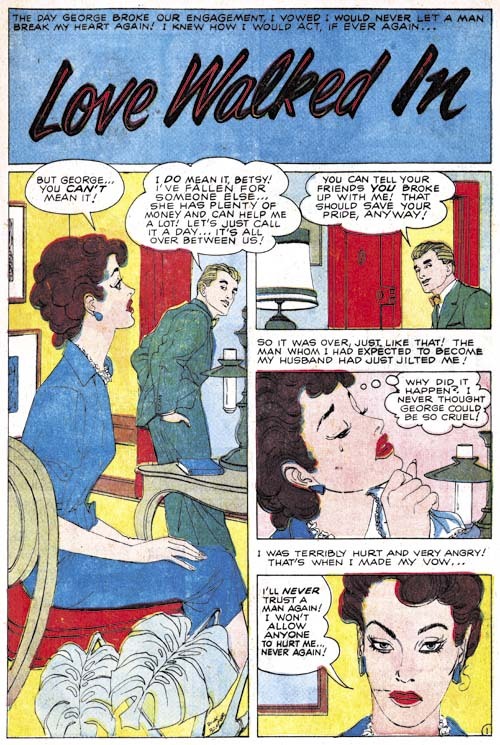 The last inking for Harvey was early 1958. 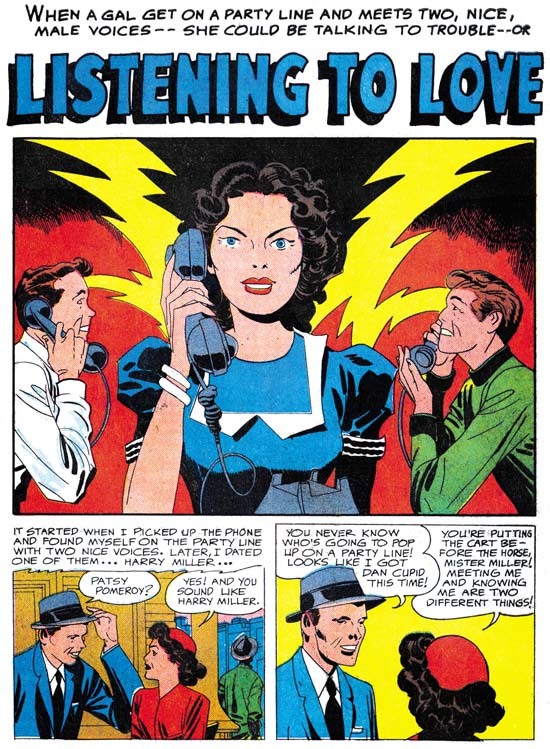 His last DC work was in June of 1959. 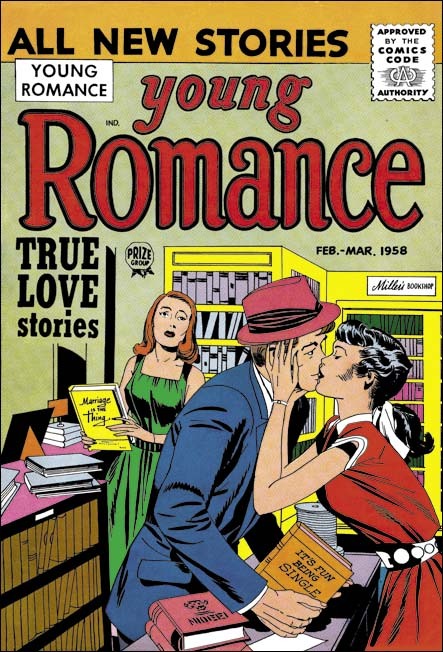 So the work Jack did for Young Romance was the last that he would more or less regularly ink. 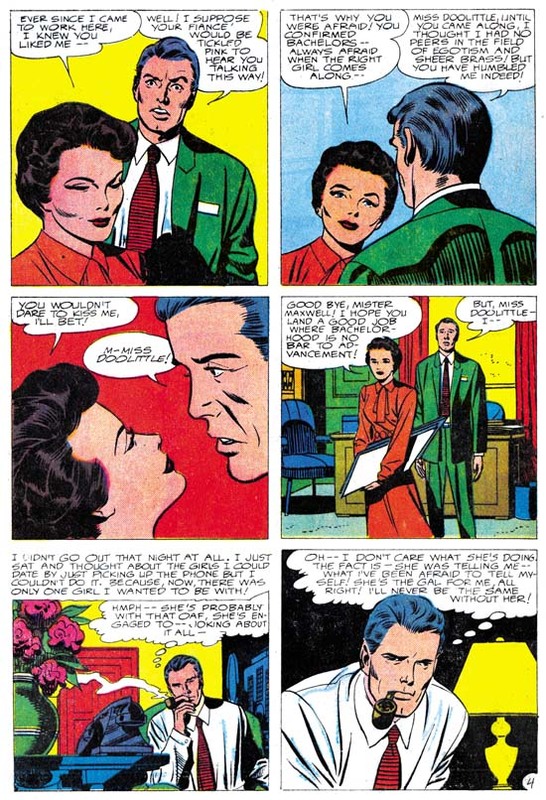 Kirby did a great inking jobs right up to the end of 1959. Although I name Jack’s “late” inking style Austere that should not interpreted that all Jack’s inking at that time was simple and light. More effort would be used if the occasion called for it. This splash is a case in point. But even with all the spotting done you still get the overall feel of something done simpler then with the S&K Studio style. 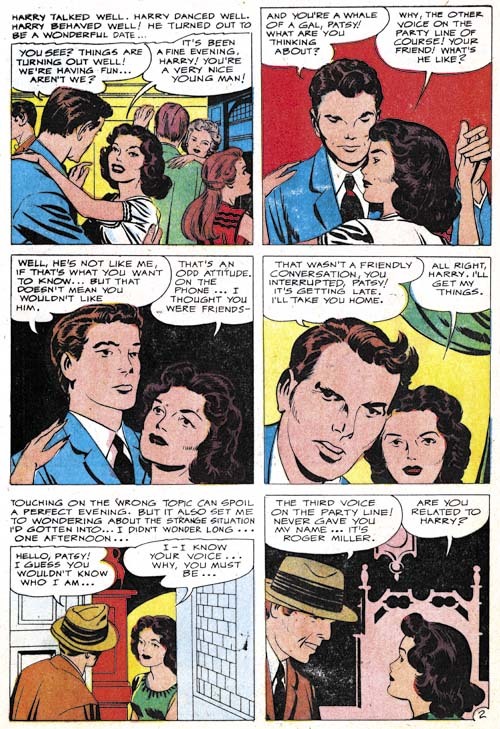 One of the things that originally drew me to Simon and Kirby’s art was their Studio inking style. Bold yet sensitive. 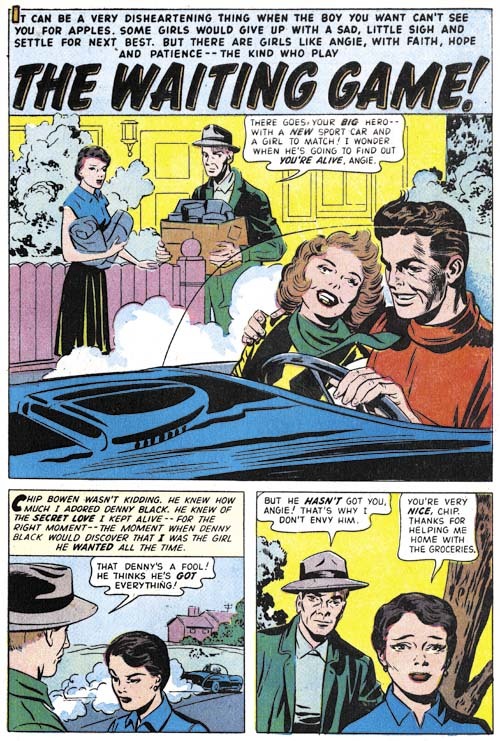 However Kirby would discard some of the things that made the Style so bold, in particularly picket fence brush work, when he evolved the Studio into the Austere style. Despite the loss of so much of what I love, the later inking is every bit as beautiful in its own way. It was no accident that the Austere style came into being during 1956. 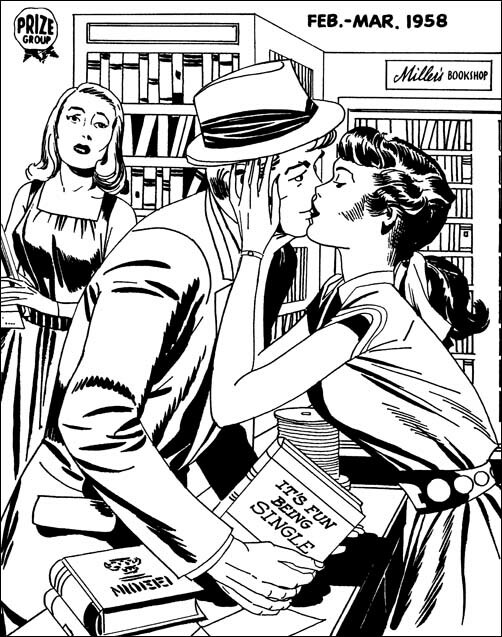 That was the year that Jack was doing pretty much all the art for the three Prize romance titles. With all that work it is not surprising that Jack would look for ways to speed up the process of producing his art. Many artists when faced with difficult schedules will cut corners to the determent of their final product. 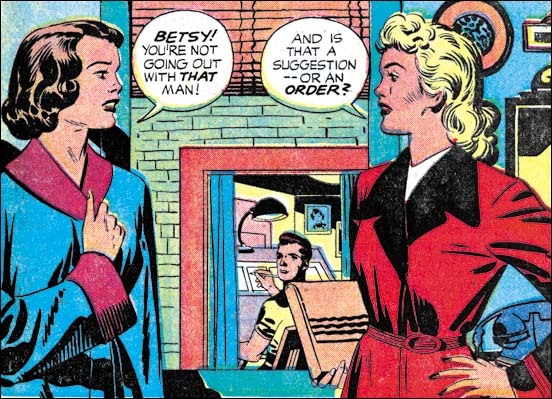 Not Jack Kirby. Jack did not just discard time consuming brush work, he modified what the inking he continued to use to make up for what he discarded. The Austere style may have been quicker, but Jack would not let his art deteriorate to achieve that. This is the final chapter to this serial post. Next week I will provide a checklist of Kirby inking Kirby for the period I have delt with in “Jack Kirby’s Austere Inking”. Also a glossary of the inking terminology I have used. 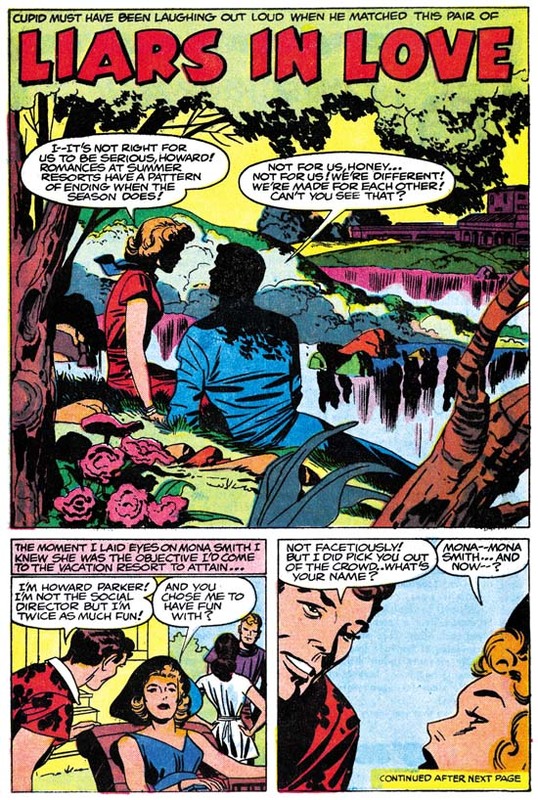 Of course since this post dealt with the final years of the Simon and Kirby collaboration, there is a lot more to be said about Kirby’s inking in previous years. But I am not ready to tackle that yet. 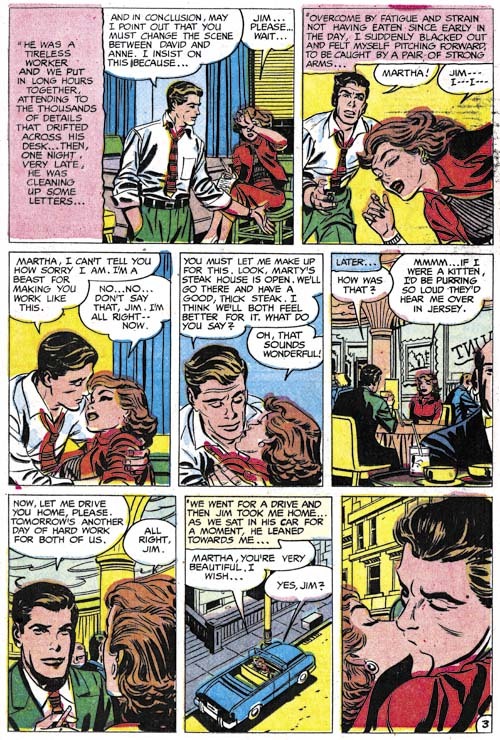 Before then I want to discuss some of the other inkers of Kirby’s pencils. If you want to spot Jack’s inking you have to understand how other artists would ink. I will not be posting on that right away but look forward to (or dread) it in the future.